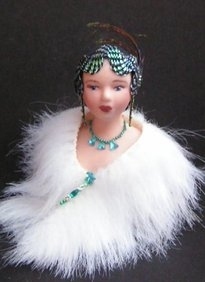 Doll Torso, small piece of soft leather, trim, Indian Bindi for earrings, small beads for necklace, feathers, faux jewels for brooch and trim on hat, piece of fake fur or similar for stole. Glue, toothpick and sharp scissors. 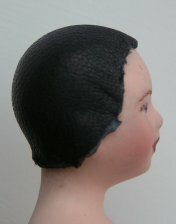 Take piece of soft leather and place over head of doll and pull tightly so there are no creases or folds, this will form a head shape in the leather. Remove the leather and spread glue over the whole of the head. 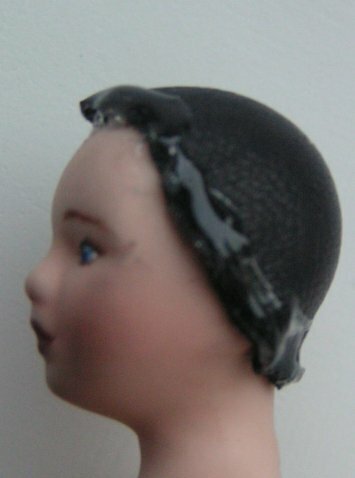 Put the leather back onto the doll fitting the head shape over the glued area, pull tightly. Trim the excess leather so you are left with a leather bathing cap look. 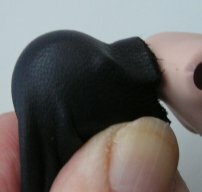 Make sure the bottom of the ears are not covered by the leather. You can draw a line on the leather as a guide if needed. Don't worry about the edges being too neat as you are going to cover them with the trim. Place a line of glue around the edges of the cap and then starting at the nape of the neck place your trim. 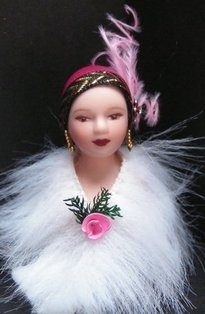 Put a dab of glue on the trim and place your feathers, add another dab of glue on top of the feathers and add a faux jewel or bead to cover it. Next put a line of glue under the bust of the torso, make sure the holes where the arms should go are covered. Place your first line of fake fur/trim over the glue. Put another line of glue above the first layer and place the next line of trim over this. Place a dab of glue at the front where the trims meet and secure. Place a rose or brooch at the centre. 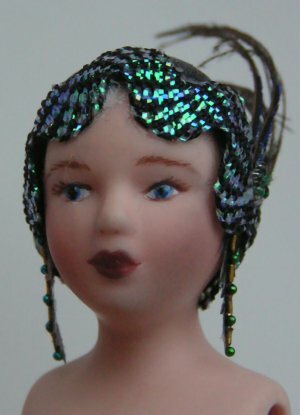 You may like to add a necklace or some beads now. 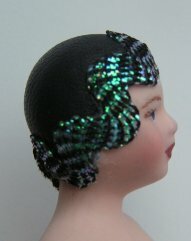 You now have a pretty Art Deco Hat stand for you shop or house. For personal use only not for reproduction in any form without permission. A selection of hatstands are available for sale in the mannequins part of my shop.